It all started in 2008, when Nick Fury told Tony Stark about the Avengers Initiative. Since then, we've encountered a host of incredible heroes — a super soldier, a war machine, an assassin with red in her ledger — but ten years after Iron Man hit theaters, Earth's mightiest heroes are set to face their toughest challenge: Thanos the Mad Titan. Directed by Joe and Anthony Russo, Avengers: Infinity War will feature at least 76 characters, be Marvel's longest movie to date, and revolve around six mysterious stones. But even if you're a diehard fan of the Marvel Cinematic Universe (MCU), it's difficult to remember every important detail. So if you need a primer to prepare for history's biggest superhero movie, then read along as we cover everything you need to know before seeing Avengers: Infinity War. And be warned, we're spoiling every single Marvel movie released so far (including some info about the upcoming film). As the god of thunder once wondered, who is the purple man in the floating in the chair? 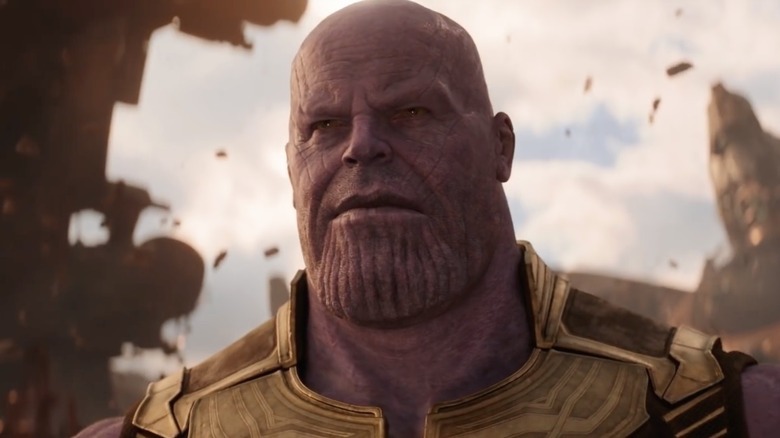 Thanos the Mad Titan has loomed over the MCU since appearing in the mid-credits scene for The Avengers. Since then, the alien warlord has popped up in Guardians of the Galaxy and Avengers: Age of Ultron, but we haven't really gotten to know the guy. What does he want with Earth's mightiest heroes? In the comics, Thanos was a member of the Eternals, a race of genetically-engineered superhumans who colonized Titan, Saturn's largest moon. Incredibly intelligent, uber-powerful, and born deformed thanks to a mutant gene, Thanos was absolutely obsessed with Death…the actual personification of Death. In the comics, Death can take the form of a woman — or a creepy skeleton — and hoping to win her love, Thanos murdered half the universe with the help of the Infinity Gems (Infinity Stones in the movies). 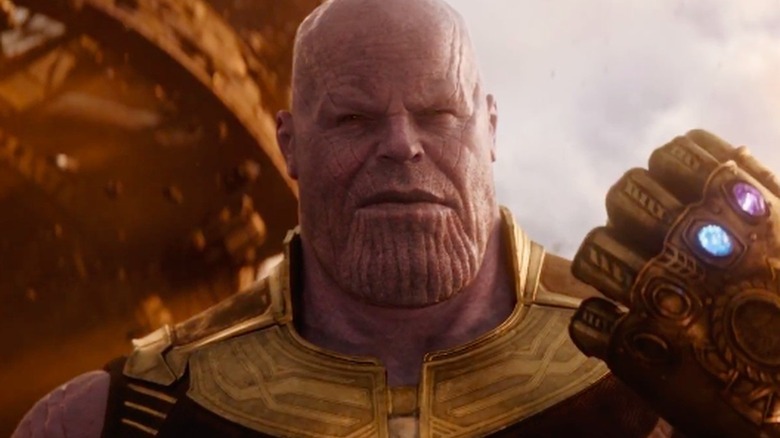 We don't know how much of that backstory will play into the film, but according to the second Infinity War trailer, Thanos definitely wants to collect all six stones so he can "wipe out half the universe…with the snap of his fingers." With his lethal crew of assassins and Outriders, it's clear Thanos means business, and when he comes to complete his rock collection, the Mad Titan might teach the Avengers what it's like to lose. Who are those creepy alien sidekicks? When Thanos arrives, he'll have plenty of backup. The big baddie has a massive extraterrestrial army, but he's also bringing his very own evil supergroup: the Black Order. 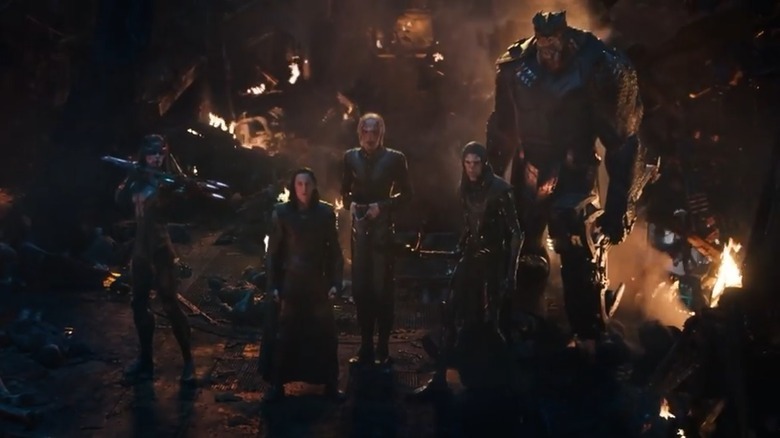 In the comics, these are Thanos' top generals, and while there are usually five, it looks like we're only getting four in the movie: Corvus Glaive (Thanos' right-hand man; carries a blade that basically makes him immortal), Proxima Midnight (insanely skilled with a spear), Ebony Maw (master manipulator, librarian-in-training), and Cull Obsidian (a hulking brute with massive strength). As an extra twist, the movie versions of the Black Order will be "children of Thanos," which could mean they're spiritual disciples of his quest for galactic destruction — or perhaps similar to Gamora and Nebula from Guardians of the Galaxy. So in addition to seeing the Black Order fighting Black Widow and trying to murder the Vision, we might also get some bitter sibling rivalries. We know Thanos wants to get his big purple hands on the Infinity Stones, but how will those rocks help him decimate the cosmos? They can blow up planets, open wormholes, and rewind time. But what's the secret behind their mystical abilities? Well, in Guardians of the Galaxy, a mysterious hoarder known as the Collector explained that before the Big Bang, "there were six singularities." And when "the universe exploded into existence…the remnants of these systems were formed into concentrated ingots." As a result, these six stones come equipped with devastating powers. "Officially" debuting in Captain America: The First Avenger, the Space Stone (a.k.a. the Tesseract) is a blue gem inside a glowing cube, and it can open portals across the universe. And if the Space Stone lives up to its comic book potential, then Thanos might gain the ability of omnipresence. Then there's the Mind Stone, which powered Loki's staff in The Avengers. These days, the Mind Stone is yellow and can hypnotize and manipulate its victims (remember zombified Hawkeye?). And in the comics, it grants Thanos the ability to control every mind in the universe. Then there's the Power Stone (a.k.a. the Orb), which appeared in Guardians of the Galaxy. A purple rock inside a metallic container, the Power Stone enhances its user's strength and can waste entire planets. In the comics, it also supercharges the rest of the stones, making them all more powerful. The most perplexing gem is the Reality Stone (aka the Aether). It debuted in Thor: The Dark World as a sentient red goo, and while Malekith the Accursed wanted to use it to plunge the universe into darkness, we haven't seen its full powers yet. But in the comics, it can be used to alter the nature of reality itself. Green and stored inside a magical locket, the Time Stone (a.k.a. the Eye of Agamotto) showed up in Doctor Strange and grants its user the ability to create time loops and reverse time. In the comics, it gives Thanos the ability to control the past, present, and future, making him a murderous Marty McFly. There's one final rock that we haven't seen yet, an orange gem known as the Soul Stone. In the comics, this allowed Thanos to control all living souls and even resurrect dead ones, so if he places all six stones inside his Infinity Gauntlet — that giant golden glove — it's hard to imagine our heroes saving Earth, let alone avenging it. Which Infinity Stones will Thanos have? Since the Infinity Stones possess insane powers, it's no wonder Thanos is hunting them down. So if the Mad Titan wants to bedazzle his gauntlet, then where should this oversized space lord look? According to the Infinity War trailers, Thanos will definitely get the Space Stone and the Power Stone. Not counting post-credits scenes, the Space Stone first appeared in Captain America: The First Avenger, when Red Skull harnessed its powers for his Hydra army. After Cap crashed Red Skull's plane into the sea, the Space Stone was retrieved by S.H.I.E.L.D. before Loki stole it, using it to open a gateway for the Chitauri to invade New York in The Avengers. After the supergroup stopped the god of mischief, Thor took the stone back to Asgaard where sat in Odin's treasure room…until Thor: Ragnarok. It seems Loki has swiped the shiny blue cube, and based on the Infinity War trailers, it looks like he'll hand it over to Thanos. As for the Power Stone, it was first discovered by Star-Lord in Guardians of the Galaxy, though it was eventually taken by Thanos' hammier-wielding lackey, Ronan the Accuser. After the Guardians beat the Kree zealot with dance moves and friendship, Star-Lord gave the stone to the Nova Corps, space cops on the planet Xandar. But since Thanos will get the purple gem, things probably won't end well for the Xandarians. Where are the rest of the Stones? 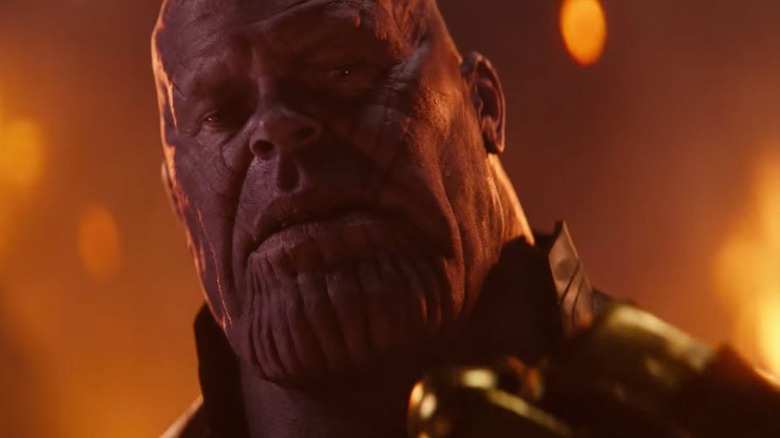 If Thanos gets the Power Stone and the Space Stone, then where are the remaining four stones? Doctor Strange placed the Time Stone inside the magical compound of Kamar-Taj. 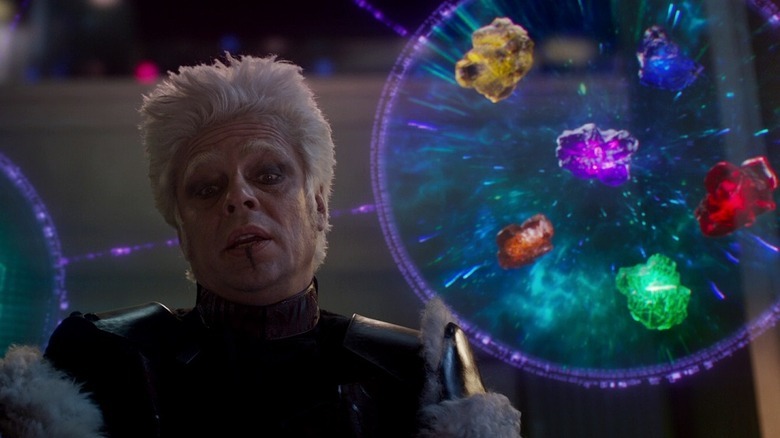 Following the events of Thor: The Dark World, the Reality Stone was given to the Collector, though after the explosive events of Guardians of the Galaxy, who knows if he still has it. And then there's the Mind Stone, which has been everywhere. It was the energy source for Loki's spear, courtesy of Thanos (who probably regrets handing over his prized possession). Following Loki's defeat, the spear was stolen by Hydra agents, who used the Mind Stone to unleash the powers of Quicksilver and Scarlet Witch. Then, after creating Ultron, the Mind Stone ended up in Vision's forehead, granting him the ability to fly, shoot lasers, and walk through walls. As for the Soul Stone, nobody knows where it's hiding. There are plenty of theories being kicked around — maybe it's in Wakanda (unlikely); maybe Heimdall has it; maybe it won't show up until Avengers 4; maybe Thanos has it stashed away — but we'll find out soon. What happened to the Avengers? The Avengers assembled in 2012, saving the world from Loki and his Chitauri army. Since then, they've reunited for Age of Ultron and Civil War, battling Hydra agents, a psychopathic android, and a vengeful special ops soldier. Unfortunately, the Avengers got careless in their quest to save the world, leaving human casualties in their wake. As a result, the group was pressured into signing the Sokovia Accords, a U.N. resolution demanding control over Earth's mightiest heroes. The Accords split the Avengers in two, with some joining Tony Stark (pro-Accords) and others allying with Steve Rogers (anti-Accords). Sadly, by the end of Civil War, the group was still split, although Captain America did leave Iron Man a burner phone for emergencies — you know, like if a death-obsessed monster ever attacked Earth. Two years later, Captain America has given up the shield and his star-spangled identity. Wanted by the U.S. government, Cap and Black Widow (and most likely Falcon) are "flying under the radar," which is why Steve is sporting a beard and Black Widow is going blonde. But you can't stop a superhero from being super, so the rogue Avengers spend their free time conducting secret missions. Tony Stark, on the other hand, is still working with the remnants of the "official" Avengers (Vision and War Machine), and the Russo brothers promise Infinity War will grapple with the results of the last Captain America movie. If the Avengers hope to defeat the Earth's extraterrestrial threat, they'll have to put personal differences aside, so it will be interesting to see if Tony can get over his beef with Bucky Barnes. What are the Guardians of the Galaxy doing here? So far, the Guardians of the Galaxy haven't crossed paths with the rest of the MCU crew. But Star-Lord and his merry band of misfits will finally meet the Avengers in Infinity War, and really, this battle against Thanos is far more personal for the Guardians than it is for Tony, Cap, and the rest of the Earthbound heroes. Why? Well, Nebula and Gamora were "adopted" by Thanos as kids and turned into super assassins. Thanos was an abusive dad, constantly forcing the two to fight each other. Nebula always lost, and each time, Thanos would cut off a piece of her body and replace it with a mechanical enhancement, hoping to make her a better warrior. Naturally, Nebula has grown up hating Thanos, and in Guardians of the Galaxy Vol. 2, we learn that getting revenge against her stepdad is Nebula's number one priority. Drax the Destroyer also has an axe to grind (not that he'd understand that metaphor). While Ronan the Accuser butchered Drax's family, the ultra-literal alien knows Ronan was just following orders. As he put it in the first Guardians film, "Ronan was only a puppet. It's really Thanos that I need to kill." And with her own dark past involving Thanos, Gamora isn't a big fan of her father either. 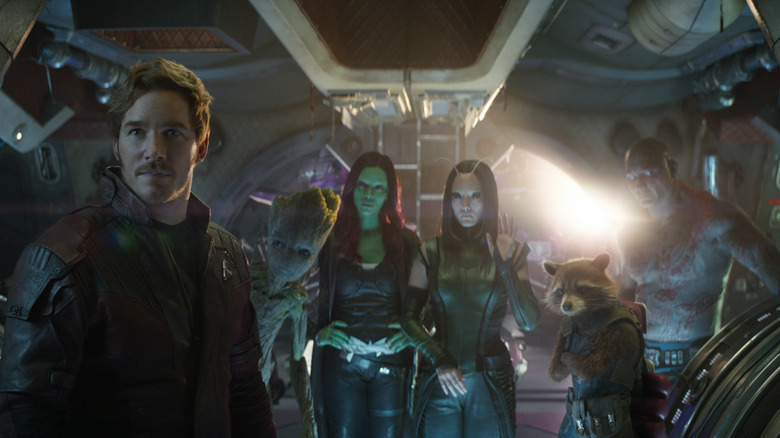 Here's hoping the Guardians — from Mantis to Rocket and Groot — teach Thanos that a finger across the throat means death. What's happening with the Vision and the Scarlet Witch? Chances are good the Vision won't make it out of Infinity War alive. Why? Well, Thanos wants the Mind Stone, and it's lodged squarely in Vision's forehead. It was placed there for safekeeping in Avengers: Age of Ultron, when Vision was created with a combo of vibranium, J.A.R.V.I.S.' intelligence, and Thor's lightning. We're not entirely sure if the Mind Stone is keeping Vision alive, but it seems logical that his health is connected to that yellow gem. Wanda Maximoff, a.k.a. the Scarlet Witch, also got her psychic powers from that particular gem, so maybe that's why she and Vision get along so well. 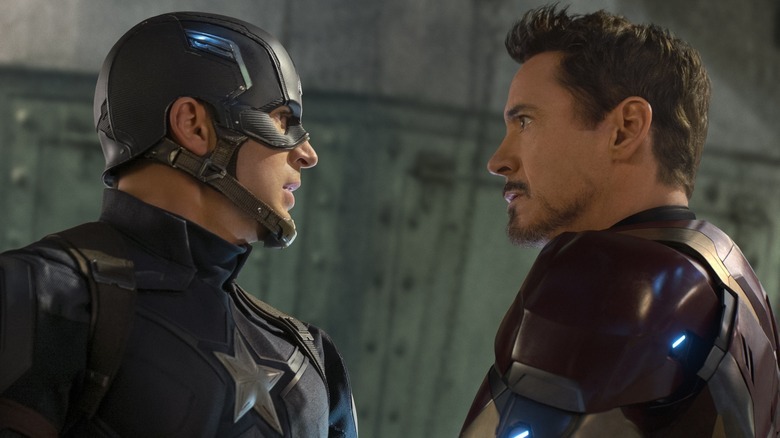 There was definitely romantic tension between the two in Captain America: Civil War, and that might develop into a full-blown romance for Infinity War. 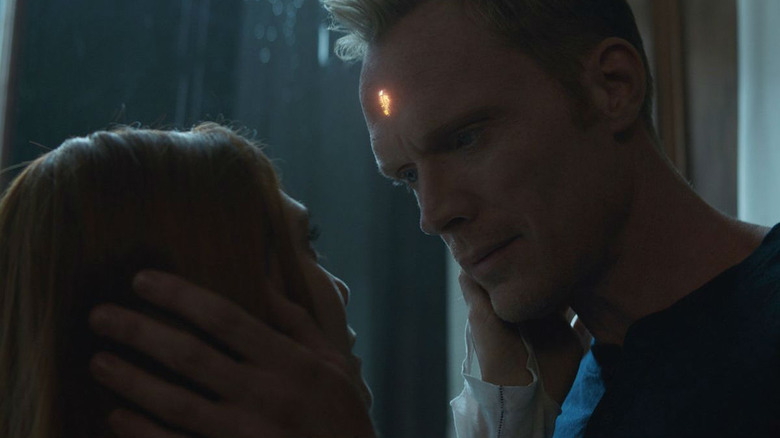 The trailers show the two together, and according to actor Paul Bettany (via io9), Wanda has helped Vision understand what it means to be human and what it means to love. Elizabeth Olsen also told Nerdist that her Infinity War performance is her "most emotional arc" in an Avengers movie. It's a love affair that lines up with the comics, and it will be interesting to see how the two pull off this star-crossed affair, considering they were on different sides in Civil War. Of course, their super-sweet romance will make it way more painful if the Black Order rips that rock out of Vision's head. What's up with Thor and Hulk? When the Avengers throw down with Thanos, they're going to need their heavy hitters: Thor and the Hulk. However, the last time we saw them, the god of thunder and the green rage monster were on a different path from the rest of the Avengers…and in a different part of the universe. After Age of Ultron, Hulk left his friends behind on Earth, worried about hurting the people closest to him (specifically his romantic interest, Black Widow). Climbing inside a Quinjet, Hulk ended up on the planet Sakaar, a world of lost and unloved things, where he became a fearsome gladiator. As a result, he totally missed out on Captain America: Civil War. Thor didn't play any part in Civil War either, as he was hunting for Infinity Stones and trying to prevent an apocalypse. 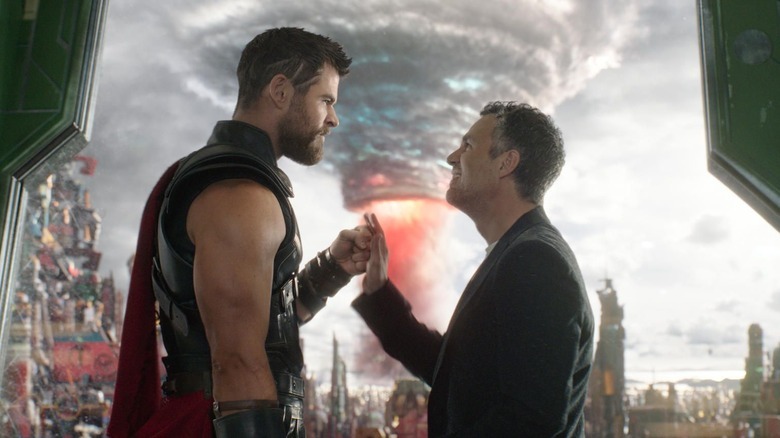 In Thor: Ragnarok, he rescued Hulk from Sakaar, lost his hammer and right eye, and destroyed Asgard to save his people from the goddess of death. And as the film came to an end, things were looking up for Thor, Hulk, and their Asgardian buddies — including Heimdall, Loki, and Valkyrie. But as they were traveling to Earth, things took a very dark turn in Ragnarok's mid-credits sequence. Out of nowhere, the Asgardians were dwarfed by an ominous warship. MCU producer Kevin Feige confirmed with TheWrap that the craft is the Sanctuary II, Thanos' flagship. (The original "Sanctuary" is that rocky world in The Avengers and Guardians of the Galaxy where Thanos lounges around on his throne.) Chances are good that Thanos will capture the Asgardian ship — probably to steal the Space Stone that Loki (most likely) snatched from Odin's throne room — and things aren't going to end well when Thor and Hulk finally meet the Mad Titan. What's going on with Spider-Man? While he isn't officially an Avenger yet, Peter Parker will swing into action when Thanos invades New York. The wallcrawler has been a member of the MCU since Captain America: Civil War (not counting that officially sanctioned Iron Man 2 fan theory), and he most recently appeared in Spider-Man: Homecoming. After facing the Vulture and learning it takes more than a fancy costume to make a superhero, Peter was given the opportunity to join Tony Stark's team. The billionaire even offered Spidey a shiny new suit, but Peter turned it down, knowing he wasn't ready for the big leagues. But according to the new trailers, it seems Spider-Man has changed his mind. After all, the planet is in danger, and Peter has accepted what many are calling the "Iron Spider" suit. It's metallic and better for taking damage if a space warlord slams you on the ground. 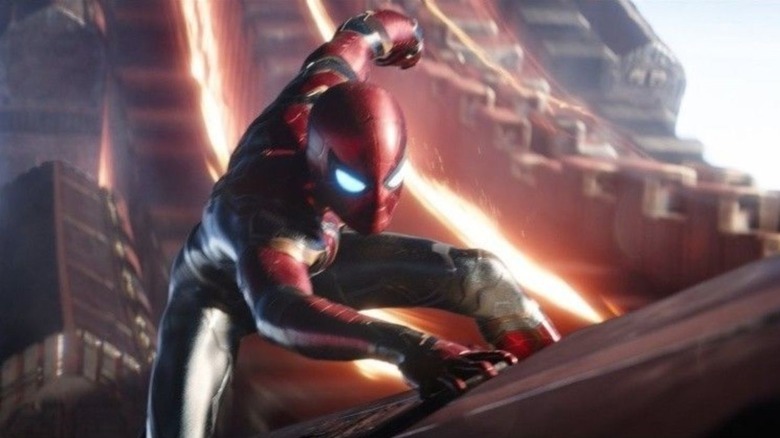 It looks like Peter's spider-sense will finally come into play, and we know he'll team up with Iron Man, Doctor Strange, and Peter Quill to face Thanos on the alien world of Titan. That's a big step up from stopping bicycle thieves. How does Doctor Strange factor into this? Doctor Stephen Strange is a man who always keeps one eye on the sky. As he explained in Thor: Ragnarok, Strange has "a watch list of individuals and beings from other realms that may be a threat to this world." And since Strange, his sidekick Wong, and the New York Sanctum (Strange's Manhattan hangout) feature prominently in the Infinity War trailers, it's logical to assume the Sorcerer Supreme knows Thanos is on the way. Unfortunately, Thanos might know about Strange too. Because Strange controls the Time Stone, it's reasonable to assume the Master of the Mystic will be on Thanos' hit list. We also know that Strange is in for a serious acupuncture session, most likely at the hands of Ebony Maw. It's a scene inspired by Jonathan Hickman's comic, Infinity, and if Marvel borrows that entire plot line, then Strange might be manipulated into betraying the Avengers. 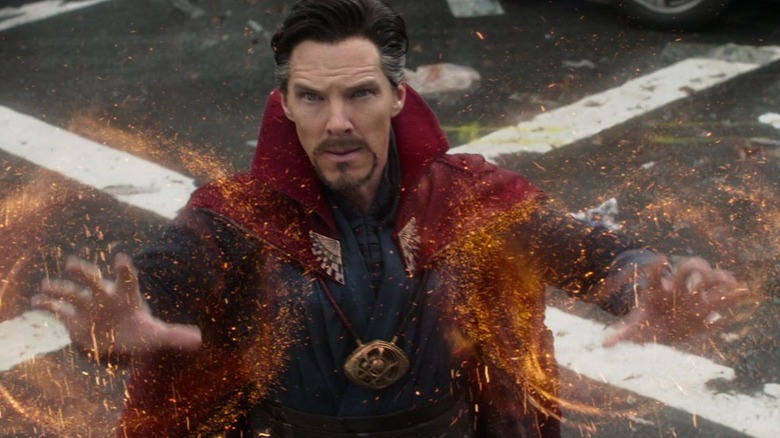 In the comic, Strange also knows the location of the Infinity Stones, so it's possible the Sorcerer Supreme could be the unwilling key to Thanos' success. What's going on in Wakanda? 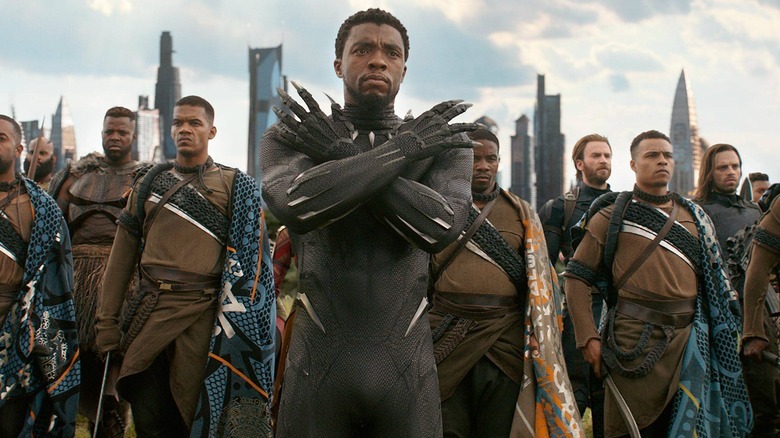 Once upon a time, people in the MCU thought Wakanda was a third-world country, but thanks to its immense supply of vibranium, King T'Challa possesses some incredibly impressive technology. And after his throne and viewpoints were challenged by Erik Killmonger, the Black Panther opened his cut-off country to the rest of the world, promising to help humanity should, say, a giant alien army come a-knockin'. Black Panther has also been protecting Steve Rogers' best friend, Bucky Barnes (a.k.a. the Winter Soldier, a.k.a. the White Wolf), since Captain America: Civil War. Until recently, Bucky has been sleeping in a hibernation chamber, but after the credits of Black Panther, the newly armed super soldier was walking around and supposedly cured of his Hydra brainwashing. So when the Wakandans face off against Thanos, Bucky will be right there, punching extraterrestrials with a brand new appendage. But why is Wakanda going to play such a pivotal part in the film? Well (major spoilers here), it has to do with the Vision. 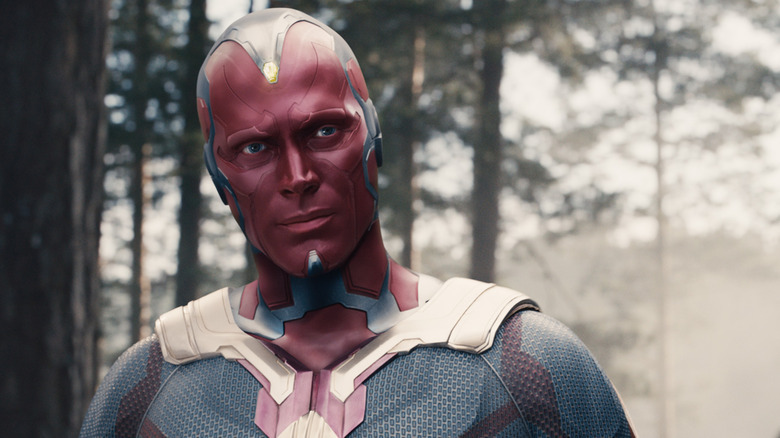 At some point, Vision is going to suffer serious damage, and Cap will take him to Wakanda for help. After all, T'Challa's sister, Shuri, is a master at working with vibranium, which is what the Vision is made of. But with the Mind Stone in T'Challa's homeland, it makes sense that Thanos and his army — in a scene inspired by Jonathan Hickman's Infinity — will battle the Avengers and Black Panther's warriors (including Okoye and M'Baku) on the Wakandan plains. Avengers: Infinity War is going to be crowded, featuring everyone from the Collector to Maria Hill. But while we've already seen the likes of Black Widow, Falcon, and the War Machine, where exactly are Hawkeye and Ant-Man? After all, Clint Barton and Scott Lang are pretty big players in the MCU, and both showed up for Civil War, siding with Captain America and going rogue. However, neither have appeared in the trailers or on the official poster. So have these two Avengers gone AWOL, or will they help take on the Mad Titan? According to the Russo brothers, Hawkeye is still around, but he's living a different life than his superhero buddies. As they told Collider, the archer is "on his own journey in this movie" and his "unique reaction to the civil war situation…puts him in a special spot in this film." 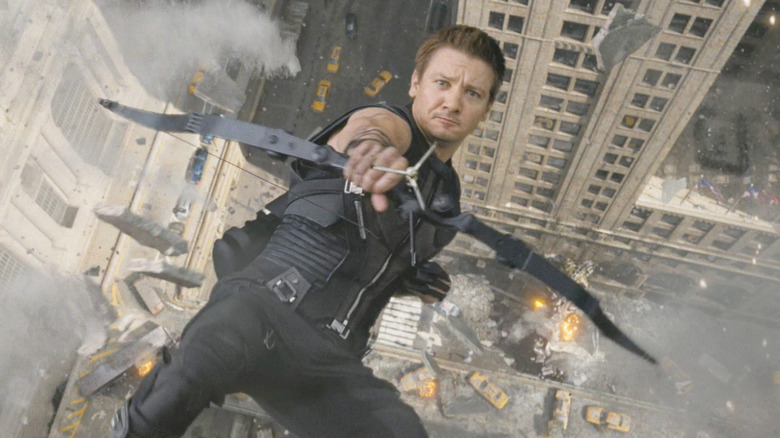 It's kind of vague, but at least we know that Hawkeye will show up somehow, and hopefully more than a few bad guys will get to meet Barton's bow and arrow. As for Ant-Man, Slashfilm reports that he'll show up in the film, and Paul Rudd is listed on the IMDb cast list. So perhaps the tiniest Avenger is lurking in the trailers somewhere, but we just can't spot him.